Twenty-five years after Alan Guth turned cosmology on its head, what’s the latest story of the universe’s first moments? It was a true Eureka moment if there ever was one. On the night of December 6, 1979, an obscure Stanford Linear Accelerator Center postdoc was up late, sweating over an even more obscure problem about particles called magnetic monopoles. Looking at his calculations the next day, the usually low-key Alan Guth annotated the words “SPECTACULAR REALIZATION” at the top of the page. Guth had discovered cosmic inflation, an idea which some have later called the most important in cosmology since the big bang. As recounted in his 1997 book The Inflationary Universe, Guth had been a young particle theorist, struggling for many years to find a stable job. And he did not know much about cosmology. Before giving his first inflation talk to other SLAC particle theorists, Guth had to cram in some basics from a popular account, Steven Weinberg’s The First Three Minutes. Weeks later, his first meeting with Stanford University cosmologists broke down into a babel of incompatible jargons. Today, Guth is a celebrated icon of cosmology. Inflation, while still an incomplete theory, is the standard “working model,” the “dominant paradigm” for the birth of the universe. But does that mean the paradigm is true? “Certainly the details we don’t know yet, but I think it’s very convincing that the basic mechanism of inflation is correct,” says Guth, now at the Massachusetts Institute of Technology. The evidence in favor is mounting. That can’t be a coincidence, many cosmologists believe, and new experiments could close the case for good within the next decade. Theorists have proposed countless flavors of inflation—among them, “old” and “new,” “chaotic,” “hybrid,” “extended,” “eternal” and “self-reproducing,” even “supernatural”—but all boil down to Guth’s original concept: a mind-bogglingly brief event, at the very beginning of the big bang, during which the entire universe went from microscopic to cosmic size. In principle, Guth thought, a kind of anti-gravity—people now say an inflaton (pronounced IN-flah-ton) field—could fill empty space with energy. That “vacuum energy,” he realized, would push the fabric of space to expand, but without diluting itself in the process. Hence, if you have a drop-sized universe filled with vacuum energy, after an instant you'll have a drop twice as large, and filled with twice the energy; one more instant and it will be four times as large, then sixteen. In other words, an exponential growth. What distinguishes the many flavors of inflation is the nature of the inflaton. Inflation was interesting, Guth realized, not only because it helped with his magnetic monopoles. Inflation could solve two cosmological mysteries. The first was the apparent flatness of space. According to Albert Einstein’s theory of general relativity, matter curves space, meaning that the rules of Euclidean geometry don’t exactly apply. But on a very large scale, the universe appears to be flat, with stars and galaxies creating only small bumps. The other mystery was the boring smoothness of the early universe, and with it, the mostly uniform distribution of galaxies that telescopes see in the sky today. The surface of a very inflated sphere looks virtually flat. Similarly, the apparent flatness of our universe could be the result of cosmic inflation. A universe that had expanded dramatically during inflation, Guth realized, would necessarily be very close to flat, just as the surface of a balloon becomes less and less curved as the balloon inflates. At the same time, the universe would be the blow-up of a region so small that fluctuations in temperature and density would be very small, explaining its smoothness. Cosmologists soon reckoned that inflation, while creating a very uniform universe, would also explain why and how the early cosmos would be lumpy enough that the stars and galaxies could form in the first place. In 1982, Jim Bardeen, of the University of Washington, and others calculated that inflation predicted the so-called density perturbations in the cosmic broth that emerged from the big bang. Density perturbations, cosmologists thought even before Guth, had to have a fairly precise character called scale invariance, and Bardeen showed that inflation was consistent with that. All those predictions have since been confirmed with increasing accuracy, through extensive surveys of galaxies, quasars, and, reaching back in time, the cosmic microwave background. The CMB is to a cosmologist what the earliest fossils are to a natural historian. It is, quite literally, the afterglow of the big bang, traveling for the past 14 billion years in all directions of space. Its electromagnetic waves have stretched during the universe’s expansion, and what’s left is now microwave radiation. 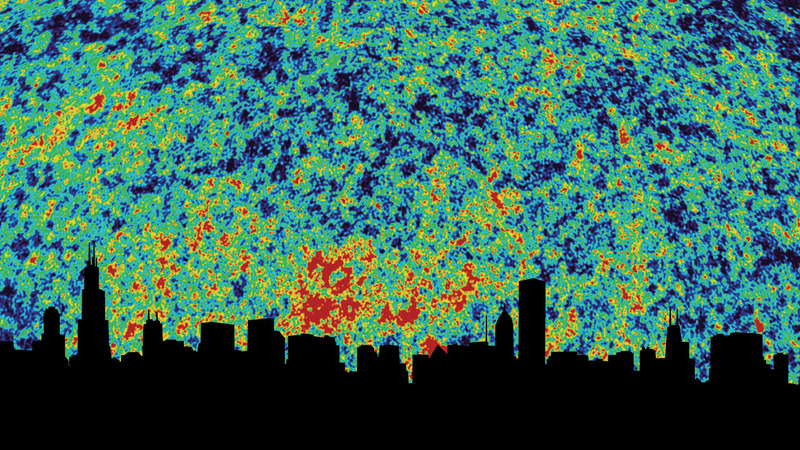 It was the discovery of the CMB in the 1960s that convinced people of the whole big bang idea. At first, though, the CMB seemed completely uniform—bearing no sign of density perturbations—until in 1992 NASA’s COBE experiment finally found small fluctuations, on the order of one part in 100,000. Subsequent experiments, culminating in last year’s Wilkinson Microwave Anisotropy Probe (WMAP) results, found striking confirmation of scale invariance. The WMAP data also gave the most convincing hints yet of the flatness of the universe, yielding another triumph for inflation. But while the experiments have made the case for inflation “very compelling,” as Guth cautiously puts it, there hasn’t been much progress on how inflation worked in the first place. In fact, Guth’s “old” inflation ended too soon, and too messily. A “graceful exit” was needed to make the universe look remotely similar to ours. In 1982 Paul Steinhardt, another co-author of Bardeen’s calculation, solved the graceful exit problem together with Andreas Albrecht; Linde also found a solution independently. Their “new” inflation worked by adjusting the shape of the potential function, a sort of mathematical roller-coaster that defines the properties of the inflaton. Most of the mechanisms proposed ever since rely on carefully adjusting the shape of the hypothetical potential function. None, it seems, has been too convincing. “All these models seem so awkward, and so finely tuned,” says Mark Wise, a cosmologist at the California Institute of Technology. Physicists would like a theory that avoids such gimmicks, one that shows how things ought to be from first principles—or at least with the smallest possible number of assumptions. “Fine tuning” is the opposite. Linde and others have even observed that, through inflation, countless, perhaps infinitely many universes could sprout from the vacuum energy like bubbles, each with its own fundamental constants of nature. That would be the ultimate Copernican revolution, with our entire cosmos an insignificant bubble in the froth of an incomprehensible “multiverse.” If so, fine tuning could be just a matter of chance. An increasing number of theoretical physicists are starting to think that these and other problems will eventually find their solution in the purported ultimate theory of everything. “Cosmology is moving toward describing things in terms of string theory,” says Guth. String theory is an ambitious—but still hypothetical—attempt to combine all laws of physics into one mathematical framework. All particles and forces of nature would be explained as notes played by tiny vibrating strings living in a ten-or eleven-dimensional world. Cosmology, says Fermilab string theorist Joe Lykken, may have been portraying the early universe too simplistically. “Unlike playing around with toy models, once you get to string theory you either solve everything at once, or you solve nothing,” Lykken says. But until recently, no one knew how to explain inflation using string theory. It’s not that string theory couldn’t produce an inflaton, says Lykken; the problem is that it produced too many. The wake-up call, Linde says, came at a Mumbai conference in 2001, when Princeton’s Ed Witten, a recognized string theory guru, admitted that he didn’t know how to explain inflation using string theory. “At first,” jokes Linde, “string theorists said ‘Too bad for inflation,’ while cosmologists said ‘Too bad for string theory.’ ” Soon, however, Linde started collaborating with several string theorists—including SLAC’s Eva Silverstein and Shamit Kachru—and began to fix the situation. In string theory, says Kachru, the inflaton candidates are what determine the shape of space in the extra dimensions, those invisible to us. In previous calculations, as inflation unfolded, the geometry of the extra dimensions would go berserk, either curling up or exploding out of control. A paper published last year by Kachru and Linde together with Stanford’s Renata Kallosh and Sandip Trivedi of the Tata Institute of Fundamental Research, India, made a breakthrough. “We have new theoretical tools to fix those shapes,” Kachru says. That was a huge step forward, says Lykken, who is not connected to the study. It was a tour de force that took many specialists by surprise. “I would have said that we were 10 years away from being able to do that,” he says. The authors admit that this is only an encouraging first step. For one thing, “stringy” inflation seems to require a very complicated fine tuning, as Linde found in a paper with seven other authors. Linde says that was a record number for him. “The reason is, it took eight authors to fine-tune the parameters to get a nice inflation,” he says. With Neil Turok of Cambridge University and other collaborators, Steinhardt has for the past three years been pursuing an idea that would get rid of inflation altogether. In their cyclic universe model, our universe would be part of a larger universe, one of two parallel, three-dimensional membranes separated by a tiny gap in the fourth dimension. A collision of the two membranes would release enough energy to cause the big bang—in fact, many big bangs, coming at regular intervals of perhaps several trillion years. Steinhardt says theirs is a “holistic” approach, because it explains the big bang and dark energy at once. “Provided that the big bang is something tractable, something that things can pass through, from before to after, [our model] can produce the homogeneity, flatness, and density perturbations that you get from inflation.” A periodic big bang, he says, would also solve the “singularity problem,” the question of what came before the big bang. That’s something inflation can’t do, because it starts with a singularity, a point in time where the laws of physics break down. And, in its current form, the cyclic model also needs a good amount of—you guessed it—fine tuning. But Steinhardt thinks it looks at least as promising as inflation. But while inflation predicts flatness, flatness does not imply inflation—there could be other reasons for it. The same applies to the scale invariance of the density perturbations calculated by Bardeen, Steinhardt and Turner. But, Turner says, current error margins cannot discriminate between inflation and “vanilla” scale invariance. “One of the things I’ve tried to emphasize for twenty-some years is that inflation doesn’t predict scale invariance. It predicts almost scale invariance,” he says. If better measurements could tell the difference, that could be a big success for inflation. Virtually all experts agree that, eventually, the definitive proof could come from an entirely new kind of observation. Einstein’s general relativity predicts that inflation would have released gravitational waves, deformations in the geometry of space that would have traveled around the universe ever since. By now, those waves would probably be too weak to measure—no one ever has. But some marks of their passage could have affected the early universe, leaving ripples frozen in time in the picture of the CMB sky. At first, cosmologists thought those marks would be so weak that they would be drowned by the density perturbations. But in 1997, two different teams figured out independently that the gravitational waves would leave a characteristic signature. “That gave us a hope of measuring the gravitational waves even though they have a much smaller effect than the density fluctuations,” says Fermilab’s Albert Stebbins, a member of one of the teams. A new generation of radio telescopes is being developed to hunt for the gravitational waves. The measurements could be very difficult, or even impossible. But then, experimentalists have defeated skeptics time and again, with results that once sounded like science fiction. “That seems to happen almost every year now,” says Guth. For now, Guth has cemented his ideas of inflation in the cosmological canon. In the Adler Planetarium and Astronomy Museum in Chicago, an exhibit honors the great astronomers and cosmologists from the past, from Galileo and Copernicus to Herschel and Hubble. And at the end of the exhibit—with a note pointing out that this is still work in progress—is Alan Guth's notebook, with his original calculations and the “SPECTACULAR REALIZATION.” Like the earth-centric cosmology of Ptolemy, also featured in the exhibit, inflation could be one of the ideas that were so influential in their time that they are still seen as a milestone, even though they turned out to be wrong. Only time will tell if Guth’s idea is here to stay, or if another Copernican revolution will eventually replace it. Editor’s note: It appears that Guth’s idea is indeed here to stay. See the “Physicists find evidence of cosmic inflation,” about a March 2014 announcement made by the BICEP2 collaboration.